OnFarm is one of the few Ag software companies founded and operating in an agricultural heartland. We were founded in 2012 by Lance Donny who thought there must be a better way to help farmers get the most out of their data. Ever since, we’ve been working to make the decision-making and data analysis as easy as possible for the hardworking farmers in the valley and all over the world. 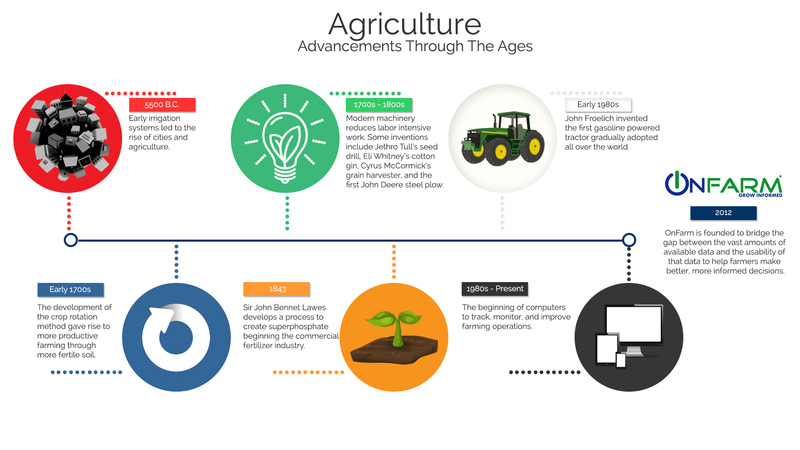 From our company’s own humble beginnings, we thought it would be neat to take a look back at mankind’s many accomplishments in the advancement of agriculture. We hope you enjoy this brief trip through agricultural history. If you want to share or save the graphic to your computer click the image to get a full size copy of it. Sign up for OnFarm today; simple to start, no commitments.